Today I worked with Tim on a Steinway at BHA. It was a hands on restring of a Steinway grand. Had a great time. We put on a new set of bass strings and then did the initial tunings. I did a restring with Jack in the beginning and that is when I started in on my piano tech learning. Today it was more hands on and I learned a ton doing this job. It helps in this field to get you experience next to techs who have high skill level and I was able to take the time to perfect winding and making very nice coils. I’ll post some picts later. This Steinway got over-sized pins and new key tops. If you have a nice piano and it sounds dead in the bass, you may consider a re-string of the bass section. This will make the piano sound amazing compared to old tubby bass strings. 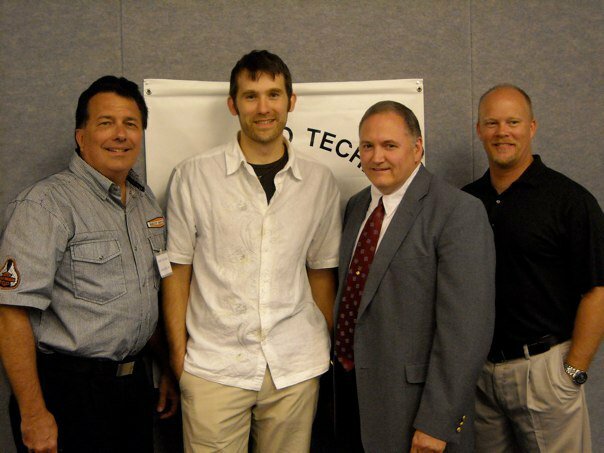 I was sponsored into the MPT by my personal mentor, Jack Hamilton, in 2009 and finalized my induction into the Master Piano Technicians at the 2010 Convention at Myrtle Beach. 3 other techs were accepted this year. I was also elected Web Master for the MPT to help them with their national sites and to help use modern web media to strengthen the orginization. MPT is dedicated to piano technicians helping them network, train and grow to be the best in the industry. 2010 Graduate from the Randy Potter School of Piano Technology. Course covers tuning, repairs, regulating, voicing, and business practices.